Some of us hate resolutions and simply refuse stating “I don’t believe in resolutions.” Others live by an unwritten New Year’s code and make a thorough list of resolutions. A University of Scranton study found that at least 60% of people who made New Year's resolutions dropped them by the 6 month mark. So does this mean we shouldn't try to make changes? No. That same University study found that people who actually created resolutions were more likely to successfully create the change - 10 times more likely! So, how can you make the changes stick? Well...read on. If you want to achieve change, there are steps to make the change happen. First, get support. Find a friend, a family member, a trainer, a class, a therapist, or a support group to go the distance with you. 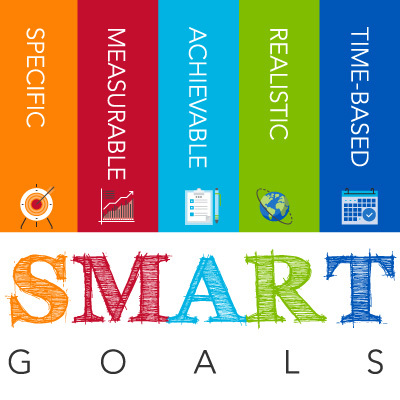 SMART is an acronym for a system to help you achieve your goals. Follow the guidance below, and you'll find it easier, we hope, to successfully make your resolutions stick. M=Measurable. Now that you have the Specific resolution in mind, you can set steps, or mini-goals, to get to your goal. Okay, let’s say your ultimate goal is to exercise 30 minutes 4 times a week. You want to reach that goal in 6 months and keep it up for the rest of the year. First thing to do is set some dates to get to your "mini-goals." For example, in the first month, you will exercise 1 time a week for 30 minutes each time. The second month, you will exercise 2 times a week for 30 minutes each time…and so on. If you successfully finish each of the mini-goals you set in a month, you will be one step closer to your ultimate goal. If you do well in a month, you can celebrate your success! But, say you don’t make all your mini-goals one month. It’s okay. By breaking your big goal into smaller mini-goals, you can fix your milestones and create new steps so you can still reach your overall goal. A=Attainable. When you create a resolution, make sure it's one you can keep. In other words: don't set yourself up to fail. Say you want to quit smoking. You’ve been smoking 2 packs a day for 20 years. If your resolution is that you're going to quit tomorrow and that's the end of it, chances are you probably won't keep that resolution. If you want to lose 50 pounds in one week (which is physically impossible and dangerous), you're definitely not going to keep that resolution. You can't! It's not attainable. R=Realistic. Be realistic: if you make a resolution, is it something you really want? Is it too easy to do? Or too hard? Does it mean something to you? Like, if you decide to make a resolution to change the way you eat, but you don't really (REALLY) want to and it doesn't really matter that much to you, you will probably go back to eating ice cream for dinner. It's not enough to write out a goal that isn't something we really want. You have to want to make the change to get there. T=Time-based. The often frustrating part of New Year’s resolutions is that we don’t tell ourselves “when” we’ll make all these changes. So, if you have many resolutions on your list, give yourself timelines to stick to. Set a SPECIFIC date so you can MEASURE your success! By the way - you don't have to go this alone! Our Behavioral Health crew love to help people make the changes that can help them live more meaningful, healthy, and satisfying lives. Give them a call: 410-837-2050. Sick of the holiday music and those sappy-happy-ending holiday movies? Nervous about seeing the family? Wishing for August? Relating too well to the Grinch - before his heart grew 3 sizes that day?? So – what causes the holiday blues? Pressure to have everything done and done perfectly. Changes in our eating and sleeping routines. Family...of origin AND of choice can push all sorts of buttons. Memories of bad holidays past – Scrooge isn’t the only one with ‘ghosts’. MONEY – gifts, food, wrapping paper…it all adds up. Loneliness - this is the time of year you notice who is in your life, and who is not. Limit alcohol and goody intake – even though the spiked eggnog may be calling you! Do your best to maintain your sleep and exercise routine. Limit gatherings: Don’t do something on a holiday if you wouldn’t do it on a normal day. If your family drives you crazy, shorten your family visits - or you may want to not go at all. Give yourself a break – literally. Take a break - turn off your phone, put on a non-holiday movie or read that book you mean to read this summer, play some favorite tunes, and hit your personal refresh button. Learn to accept imperfection - what is perfection, anyway?? If you struggle with loneliness, reach out to friends and family or find a local church, support group, or meet-up. Now is the perfect time of year to ask for help. And, believe us: you're not alone! 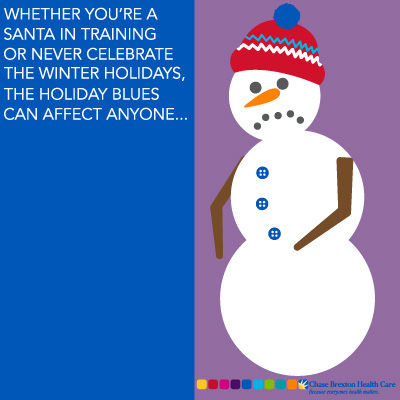 If you find the holiday blues spill over into January, February, and March, talk to your health care provider or make an appointment with one of our behavioral health team. You may be struggling with depression. May your days be calm and your nights be restful! 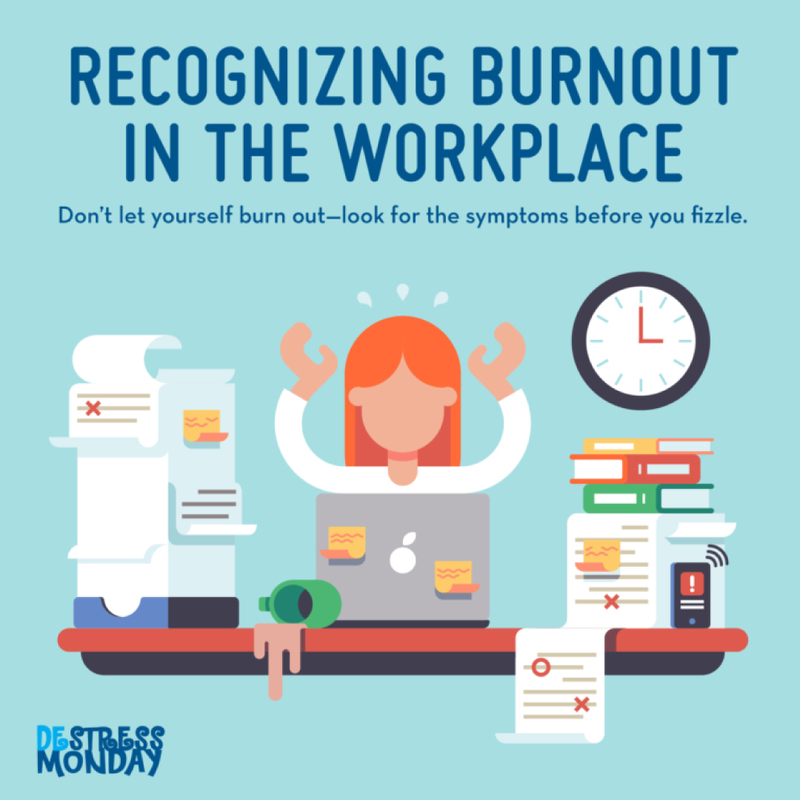 Workplace Burnout - Recognize It. Change It. Smile. Most of us want to do well in our job. Be a great part of the team. Feel successful and productive. But this can mean we try to do too much - aim too high, overwork ourselves, and, then, find ourselves burning out. We all have stress in our lives but workplace stress can take a serious toll on your physical and mental health. Our schedules can affect our eating habits - we grab a vending machine meal or down a bunch of soda in a hurry and that can result in weight gain and cholesterol problems. High levels of stress can also affect our sleep, raise our blood pressure, and may increase the risk of heart disease. Then, burnout can do damage to your mental health - causing us to doubt ourselves, feel anxiety about our job security, and sink into depression. Even if your working at your dream job, workplace burnout can make you dread going to work. Bad days are normal. But when bad days are everyday, when you feel like you can't stop thinking about your job and it's weighing you down, it's time to make some changes. Take breaks. Use your break times to walk around - get away from your desk, or away from customers, whatever you do find space away from the job several times during your shift. Five minutes away here and there can make a big difference. Take a breath. Deep breathing for a few minutes helps to reduce stress pretty quickly. Don't know how to do deep breathing? Check out these resources. Get living. Make sure you have something to look forward to away from the job. It could be crocheting or hiking. Maybe you take a class for fun. Or join a book club. Options are out there - find your thing beyond the walls of work. Get a work buddy. Sometimes having a co-worker help you talk through your work can really help you manage your work better. Find a colleague you like, trust, and admire - then get to talking. Talk it out. Chase Brexton's behavioral health team are able to bring all of these ideas together so that they work for you. Give them a call to get in for a session (or three!). IMPORTANT: Throughout the world wide web, there is a ton of information about health care - some true, some not so true, some just plain wrong. Any information about your health is best to get from your health care provider. The information contained here is just guidance and should not replace any advice from your provider. It's important that if you have a health concern, that you talk to your provider.